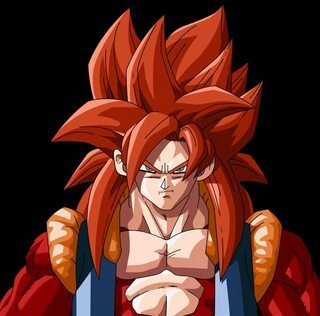 Why does Gogeta SSJ4 have red hair then? There isn't a definite answer for this and considering the fact that Dragon Ball GT isn't canon, we aren't going to get any definite reason as to why this is the case. I wouldn't call it a mistake as certain mistakes like Vegeta's brown hair were actually acknowledged and corrected while Gogeta's red hair is continued even in the recent Dragon Ball Games like Xenoverse 2. There are a lot of interesting theories in the Dragon Ball Community. The two most common theories would be, Some people believe SSJ4 Goku and SSJ4 Vegeta fused attained a transformed even beyond SSJ4 just like Gotenks was able to attain SSJ3 in Z. While this theory is a little hard to believe, the other recurring theory which even I personally believe makes more sense is that SSJ4 Gogeta's looks a lot like SSJ4 Goku(apart from the color change) and the red color hair was done on purpose to further distinguish the 2 characters. All the pure saiyans are black haired, so Gogeta SSJ4 have to be black haired too. He appeared for the first time in the 60th episode of Dragon Ball GT. This Dragon Ball series isn't part of the original main story.